Good Monday! Hope everyone had a great weekend. We took a chance and took the kids to Disney Friday night with some friends. Apparently so did the rest of the entire state of CA. I have never seen the place so busy. Despite the crowds, we still had fun running around. Also got the boys 2 beta fish that almost ended as a major disaster. See bottom of post!! You guys are going to love this fun little cookie. I have a long history with Cinnamon Toast Crunch Cereal. I vividly remember sitting on the couch every morning when I was pregnant with my first son devouring a nice big bowl of my favorite cereal. It was so convenient to perch the bowl of cereal right on top of my pregnant belly, just like my own personal table! That’s the one thing I do love when pregnant! Ok, enough of that…. I was lucky enough to receive a big box in the mail from General Mills full of a variety of their cereals. It’s been so much fun using them in recipes. This is another cookie dough that is crazy good. One bite and you might not be able to stop! Hope you all enjoy. 1. Preheat oven to 350 degrees F. In a stand or electric mixer beat the butter and sugars until light and fluffy. Slowly beat in the eggs and vanilla until well combined. In a large bowl combine the flour, Cinnamon Toast Crunch Cereal, baking powder and salt. Slowly add to wet ingredients along with the white chips until just combined. With a medium cookie scoop, scoop dough and place onto a silpat or parchment lined baking sheet 1 1/2 inches apart. Bake for 9-12 minutes or until edges just start to turn golden brown. 2. Let cool for 5 minutes on baking sheet then transfer to a cooling rack to finish cooling. Enjoy with a tall glass of milk! My boys have been begging for a puppy for at least 2 years now and we (my husband and I) are just not quite ready yet, so I broke down and got 2 Beta fish for them. 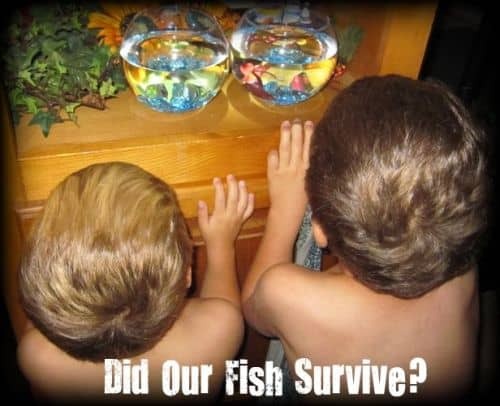 As I was getting their new fish bowls ready, not paying attention to the fish I put in little cups, my oldest comes over screaming “Mom, Tommy is flipping on the the counter!” I felt so bad, I hurried and got him into water but wasn’t sure how long he had been out. 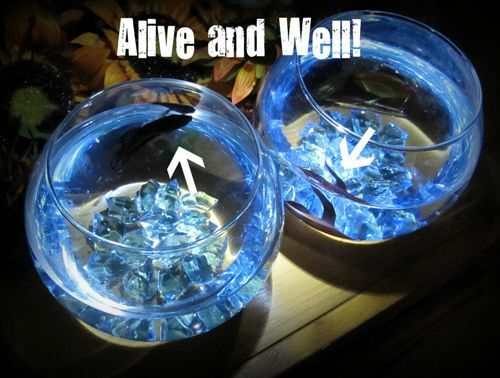 The next morning, we were all celebrating both fish swimming in their bowls! So far so good. Tell me I’m not the only one who’s almost killed a family pet! Have a great new week! See you soon with more good cookin’! Done! 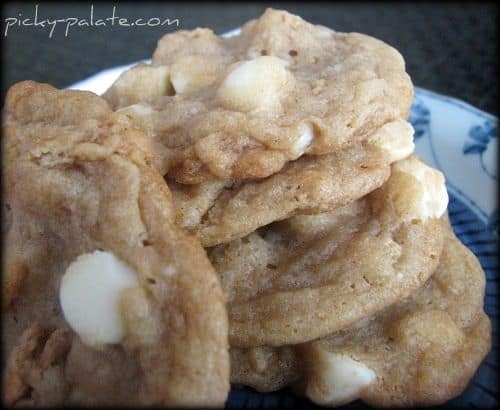 These sound absolutely perfect…cinnamon and white chocolate are my husband’s faves!! YUM – that sounds good and I got a box of that cereal in the mail the other day. Perfect recipe to try. And the boys look adorable watching their new pets! YUM, I am pregnant and LOVE CTC! Well, I love it when not preggo too..
My son’s birthday party was over the weekend and we got him a fish tank too.. unfortunately one of the fish DID die, luckily he’s only 2 so he didn’t notice! I must admit, I love the cereal even when I’m not prego too! Sorry about the fish, but nice that your son didn’t notice! Our little fish are still swimming! I love cereal, I only buy sugar cereals for dessert though:) Love how you included them in the cookies! I’M OFF TO BAKE THEM TODAY ! I love Cinnamon Toast Crunch! This is the perfect way to enjoy it even more! These are brilliant! Cookies look and sound great. Glad the fish is okay. No pet fish at my house anymore. Except on a plate. These cookies look amazing! And it just so happens that I have a box of Cinnamon Toast Crunch in the pantry 🙂 Thanks for the recipe! I just love your website – so many great ideas! Those cookies look yummy! Never heard of that kind – might need to give it a try! Anyway, on the fish front, we had 3 betas in tall vases on our fireplace mantle. One day one of them just vanished – woke up to an empty vase. I blamed the cats! Well the vases were cylindrical, 1 wide and 2 narrow, and it was the wide one that was empty. So I dumped one of the narrow guys into the wide one to keep a little variety going. A week or so later the wide vase was empty again! Now this part is really gross… about a week after that, I found one of them dried up on the fireplace bricks. I guess it blended in & I didn’t notice it before. So the cats may have eaten one (never did find the second one), but they didn’t hop up on the mantle and fish them out… I’m pretty sure the fish launched themselves right out of the wide vase. I guess in the narrow vase they couldn’t get as much of a “running” start. I felt pretty guilty thinking about the poor fish flopping around on the fireplace though – hopefully the missing one was put out of it’s misery quickly by one of the cats. How well do you think this cookie dough would freeze? Do you think the cereal will have a soggy texture when baked after being frozen? I’m eating one right now after chilling the dough in the fridge a few hours before baking. They are soggy and I am disappointed. Going to be giving these to friends who just had a stillbirth. Should I not have chilled them? If so, I wouldn’t have made them, as I never have time to bake right away. I am so sorry the cookies turned soggy Tara. It’s been so long since I’ve made this recipe. I am thinking I just baked them right after I prepared the dough. So sorry. Your cookies sound super addicting – yum! So glad you were able to save the little fish! Is it really supposed to be 450 degrees for the cookies? I burned my first batch! I had the same problem……I reduced the heat to 400 degrees and the rest turned out great. But, I’ll admit, even the burned once got eaten. YUM! holy amazingness! i can’t wait to make these…white chocolate and cinnamon toast crunch…my mouth is watering just thinking about them. i’m eight months pregnant and i’m sure my doctor won’t appreciate me eating these but to heck with it such yummyness shouldn’t be passed up. Thank you for this recipe! I got my 4 year old 2 gold fish after my beta died..2 days later they died. My son fed them some of his dinner which happened to be meatloaf that night. mmm. cinnamon toast crunch! AND cookies? sounds like heaven! Genius Jenny!! Can’t wait to try this recipe!! I’ve tried at least 5 of your recipes and they all rock!! Glad your Disney trip was a fun one!! Well, I love white chocolate and I love Cinnamon Toast Crunch, so I need to make these soon! Fish can surprisingly stay out of water for quite awhile. And yes this was figured out by a beta lost in the grass at night and not being able to be found! These look so yummy! Can’t wait to make them! I love your website, I just love it. I am a total dessert junky and every time you have a new post with another AMAZING dessert on it I want to make it immediately!!! Thank you for putting all of your ideas online so I can come and see and make fun, cute, tasty desserts myself 🙂 …I try really hard to be healthy though, so it’s hard!!! 🙂 I will just have to bake for the sisters in my ward, and for our friends more often! Thanks again !!! P.S. Thank you for your recipe index, it’s amazing, and makes it so easy for me to go back to recipes I know I love! 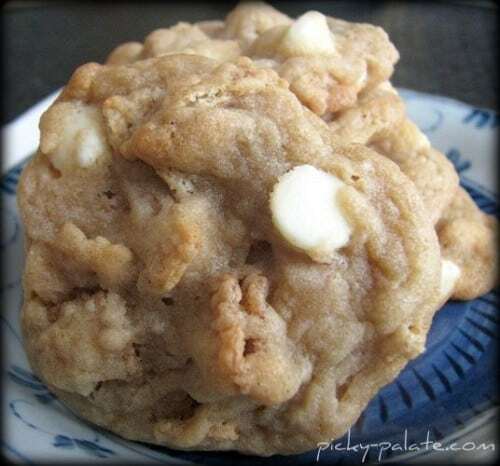 What a great idea to make a cookie using cereal…yum! Love your site! Enjoy trying your craetions. As for the pets…I was doing laundry one day and I guess it was a little cold, while the dryer was open my cat jumped in while my back was turned. I shut the door, started the dryer…..then I heard the most horrible sound! I quickly opened the dryer door and she jumped out. Needless to say she NEVER went back in the laundry room again! I had a very bad track record with pets as a kid so I can completely relate. Shockingly my puppy seems to be doing well so I can’t be that bad of a human. It’s been awhile since I’ve thought about cinnamon toast crunch (although I did eat it a lot as a kid) and this sounds like an interesting way to use it. omg! This is the first recipe I’ve tried off your site and they are DELICIOUS!! CTC is my favorite cereal so I knew I wouldn’t be disappointed. I’m not a big white chocolate fan so I used semi-sweet instead and they came out great! Bettas shouldn’t be kept side by side if there’s any chance they can see each other – they’ll try to fight and get stressed. I made these last night because they just looked so yummy! And they were good except that my CTC in the cookie came out kinda stale/chewy. I was wondering what I might have done wrong or if there is a way to ensure that they don’t do that again. It all tastes great, but those bites of chewy aren’t as much fun. These look and sound so yummy! I will be trying them out soon. My oldest son (8 years) saw them and wants to make them now! I LOVED these. They were super easy to make and all my co workers loved them. I just have one question. Mine came out kind of flat is that normal? 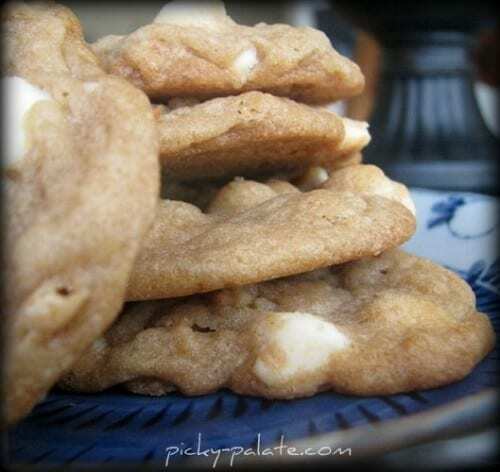 do you know this is the ONLY CTC cookie recipe on the web.. i came searching specically for a recipe for my cookie swap next week… im gonna test batch these, thanks!! btw if you have never used CTC as a topping for vanilla ice cream, you have not yet tasted heaven in a bowl….. Thanks for sharing! I loved the flavor of the cinnamon sugar with the white chocolate chip cookies, but the cereal became chewy for me. I think next time I’ll just add cinnamon sugar and skip the cereal part. Cinnamon Toast Crunch was my favorite cereal when I was younger. I bet I would love these cookies! It sounds as though you had a close call with the fish. You always have such fun cookies ideas and these are no exception. Ooh. 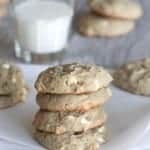 Crunchy cereal in cookies. I may just have to try this, especially since my son loves both white chocolate and Cinnamon Toast Crunch. Oh gosh I love Cinnamon Toast Crunch! Haven’t had it in ages. These cookies look awesome! I made these today, and I have to say that they were too sweet for our adult taste buds. The kids loved them though! Tried these out! Really tasty, but my cereal pieces were a little chewy in the cookie. Did I not crunch it up small enough possibly? You do have to crush the cereal really small. I did a batch with large pieces and they were really chewy. So funny! I am 30 weeks pregnant and have a big bowl of Cinnamon Toast Crunch every day… thought I was the only one! What a great recipe… they’re baking in my oven right this moment! My wife is 30 weeks pregnant and loves her cinnamon toast crunch (we shared a big bowl last night as a matter of fact). I’ve printed the recipe and will make them for her this weekend. Thanks for the great idea!! Tried making your cookies but I wasn’t sure about the size of the butter sticks and ended up with double the butter I think! They taste wonderful but I think I might have to forgo the whole batch and start again. I also had the same issue with the CTC as another reader – they turned out really chewy. I wonder if it was due to the excess butter? Do you have any suggestions to make a low fat version of this recipe? Hi friends did you r have new links ? I look after clerical better so my friend ? ..